Ground Floor of the Louvre: containing most prominently the Great Hall, the grande chambre du Louvre, and the Royal Chapel. Second Floor of the Louvre: North Side: King's Chambers; East Side: Dauphin's Chambers. 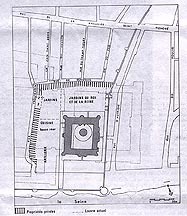 In 1364 when Charles V became king he transferred his official residence from the old palace of the Île de la Cité to the Louvre, the fortress constructed by Philippe Auguste. The remodeling was designed by Raymond du Temple. In the plan, a major division was made between the public and private spaces, each marked by a separate entrance. The major public spaces were located on the ground floor in the south and west ranges. 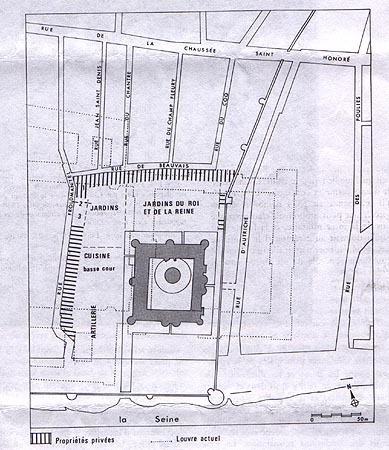 The major public rooms were the grande chambre du roi and the adjacent grande salle located in the west range. These rooms echo the additions made by Philippe le Belle to the palais de la Cité around 1300. One entered the private spaces through the monumental staircase called the grande vis which appeared on the central axis of the palace extending from the grand portail. The grande vis was richly decorated with sculptures. The staircase opened directly into the chambre à parer, and from there on through to the chambre de retrait and to the chambre du roi. The sequence of three rooms (chambre à parer, chambre de retrait, and the chambre du roi) were the principal rooms intended for the daytime use of the king. The chambre à parer or the chambre de parement was the great state room. This division became the standard in palace design in the late fourteenth century. Extending to the east off of the chambre à parer was a salle and two chambers intended for the king's night time use. Whiteley, 1994, p. 49: "Christine de Pisan in her biography of Charles V wrote a detailed description of a day in his life [excerpted below], which provides an invaluable contemporary insight into the role of the different rooms. Each of the six main rooms and six smaller rooms in his lodgings and the public rooms on the ground floor had its special function in the ceremonial and private life of the King. His day started with a morning levée and private prayer that took place in his night chambers. He then descended the grande vis into the courtyard to make his appearance in public, first attending High Mass in the grande chapelle in the south range and then making himself available for his subjects, rich and poor alike, to approach and personally present their petitions. The accessbility of the King to his subjects was an old French tradition and as a result they were freely admitted to enter his palaces. This privilege had its limits, and the division that architecturally separated the palace into public and private areas must have also had a social significance, for the courtyard and the public rooms were open to the general public, but the King's lodgings, as Christine de Pisan observed, was reserved for princes and nobles and other visitors to the court. On specially appointed days, the King attended his Council. The great Council when events were intended to be heard publicly was held in the Grand Chambre, but the day-to-day councils met inside the royal lodgings. There was a similar choice between the public and the private sides for the King to dine. On the occasion of great feasts he dined in public in the grand salle, if however he wished to be "assez à privé" he would take his meal in his bedchamber, but normally he dined in the salle of his lodgings, where he would eat alone at his table unless other princes were present. At the end of his meal, the King moved into the chambre à parer to spend the next two hours dealing with the affairs of state and receiving the numerous visitors that came from abroad and from all parts of his kingdom. This chamber was the centre of Court life; it contained the great ceremonial state bed, and was the venue for events of major importance such as the 2 1/2 hour political speech delivered by Charles V before Emperor Charles IV. 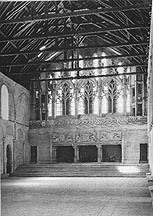 To accomodate the great crowds of ambassadors, princes and nobles that packed its space, this chamber was by far the largest measuring 19 m. by 11 m. 76 at the Louvre and up to 40 m. at the palais des ducs at Bourges. The second chamber, the chambre de retrait, served as/p 51: a secluded extension of the chambre à parer, being used for the King's Council and for private meetings and discussions. At the end of the session in the audience chamber Charles V moved into his chambre for a rest. Even this chamber was not totally private, for the King appears to have received visitors in whichever room he was at the particular time of their arrival. However his chamber differed from the rest of the royal lodgings in that visitors needed special permission to enter, and the crowds of nobles, who could freely move around his other chambers and his salle, had to stop at its threshold. 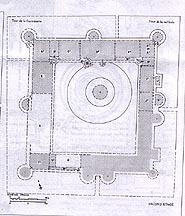 A similar slight separation of the chamber is discernible in the architecture of two castles built at the turn of the fourteenth and fifteenth centuries. 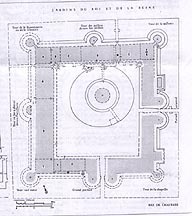 The ducal chambers at Poitiers Palace and at La Ferté-Milon were not only contained in their own tower but their level, reached by a spiral staircase, was a few steps higher than that of the chambre de retrait. It was considered essential for the King's health that a special time, away from the heavy demands of state, be set aside during the afternoon. Accordingly a series of smaller rooms were provided for his leisure and recreation. Five of them, identifiable from an inventory, survive in the King's Tower at Vincennes, occupying the turrets that project out from the central royal chamber on the second floor. The petite chapelle and the garderobe had a long tradition as being part of the royal lodgings, but by the second part of the fourteenth century the number of these small rooms had been increased. They include an oratory adjoining the chapelle, which was used by the King during Vespers, a retrait which provided the complete privacy that the chamber itself lacked, and the estude, where his finest books and jewels were stored. In addition at the Louvre, Charles V's famous library was housed behind his day chamber in the three top floors of the tour devers la Fauconnerie. At Vincennes these small rooms were all approached directly from the King's chamber and will have created an area of comfort and seclusion where the King could relax, converse with his closest friends and study his collections of treasures. To keep his privacy intact, the petit chapelle in the north-east turret was provided with a gallery linked to the main staircase so that the clergy arriving to celebrate Mass by-passed the King's chamber. The Queen Jeanne de Bourbon also kept an important Court surrounded by her ladies, even on occasions attending the Council, and her day followed an order of ceremonial that was very close to that of the King. Her position and her style of life qualified her for a lodging of importance, and at the Louvre she had on the first floor the same range of five chambers, salle, and small private rooms as the King on the floor above, lacking only his estude and library. The inferior position of the Queen Jeanne de Bourbon's lodging had undoubtedly an hierarchical significance for the same arrangement was repeated in at least three other royal castles dating from the thirteenth century to the fifteenth. 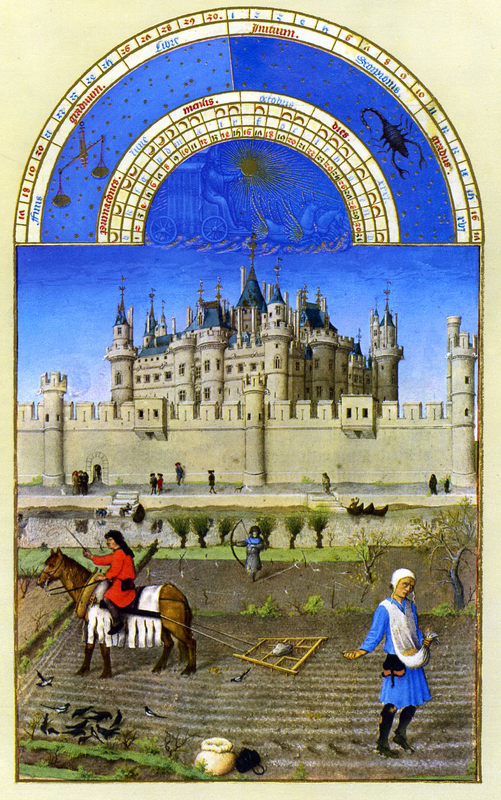 Their night chambers were linked by a small spiral staircase, whose projecting turret is visible in the Très Riches Heures, but it is doubtful whether the two spirals leading off their chambres à parer and their day chamber pro- /p.52: vided more than a shared circulation to the courtyard for, as Christine de Pizan pointed out, it was not "the custom among higher nobility for ladies to be commonly in the presence of their husbands." She confirms that their main meeting ground during the summer months was in the royal gardens which at the Louvre were privately linked to their chambres à parer by a small spiral, galleries and a bridge over the moat. 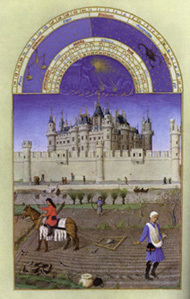 /p.54: The Courts of the Dukes of Burgundy, whether in Burgundy, Paris, or in Flanders, were the most closely modelled on that of Charles V. It was Philippe le Hardi (d. 1404) who commissioned Christine de Pisan at the beginning of the fifteenth century to write the biography of his brother Charles V with the aim that his "belle manière de vivre" would not be forgotten. Many of the recorded Burgundian ceremonies are those formalised by Charles V, but with the difference that under Philippe le Bon (1419-1467) their presentation both in the daily ceremonies and in the spectacular feasts became increasingly rigid and ostentatious. The same influence can be observed in the internal disposition in the number and type of rooms that were built at the palais des ducs at Dijon and at the palais Rihour at Lille, which were newly built by Philippe le Bon during the 1450s and 1460s. The three chambers of the ducal lodgings were each given a special role at the morning levée segregating the different ranks of courtiers waiting to greet the emergence of the Duke, the "escuyers" were limited to the first chamber, the "chevaliers" to the second and only the "grands chambellans, les plus proche du duc" could enter into the ducal chamber. However during the course of the second half of the fifteenth century there were changes in the arrangement of the diningroom of Charles le Témeraire (d. 1477). The 1467-1468 accounts for his hôtel at Bruges record a salette preceeding the ducal chamber, a development found later in both the Angevin and royal Courts, that suggests that this rooms was being used both as dining room and as reception room. Little is known of the ceremonial at the Court of the Duke of Berry (d. 1416) but from the grandeur of his architecture it must have been equally magnificent. His official residence, the palais des ducs at Bourges, was conceived on an immense scale. The grande salle, which filled the full height of the building, was 51 m. in length with a single span covering its width of 16m., and the adjoining chamber measured 30 m. A particular feature of the Berry palaces, found at Bourges, Riom and Poitiers, was the arrangement of two sets of chambers one above the other. On the ground floor the larger chamber, called variously the chambre basse, the chambre basse à parer or the grande chambre de parement, the smaller one the chambre du Conseil, formed part of the public rooms extending behind the great hall. Above on the first floor, the rooms served as the first two chambers of the ducal lodgings. A display of grandeur is also evident in the architectural details of the great halls. During the reign of Charles V fireplaces with double hearths and richly decorated with sculpture had been introduced as a symbol of a prince's prestige at the lord's end of the hall. At the palaces at Bourges and at Poitiers, this type of fireplace was made into a more impressive feature by /p. 55: the addition of a third hearth and at Poitiers by the immense decorated window behind. The high table, which previously had been raised on two or three wooden steps, was elevated even higher on a tribunal, a permanent dais with stone steps that stretched across the end of the hall. This spacious high platform enabled the Duke and his noble guests to participate in the feasts but at the same time kept them separated from the general public that packed the main part of the hall. Excerpt from Christine de Pizan, The Book of the Deeds and Good Character of King Charles V the Wise, I.xvi, as quoted in The Writings of Christine de Pizan, ed. Charity Cannon Willard, pp. 236- : I find a comparable order in the case of our own wise King Charles, so that it seems to me reasonable to recount his agreeable habit of leading a life well-regulated in all respects, which should be an example to all who may follow be it in empires, kingdoms, or important lordships for a well-ordered life. The hour of his rising in the morning was normally six or seven o'clock, and indeed anyone who wanted to make use here of the language of poets might say that just as the goddess Aurora, by her rising, rejoices the hearts of those who see her, so the king gives pleasure to his chamberlains and other servants appointed to attend his person at that hour, for, regardless of anything that might make it otherwise, his face was joyous. Then, after making the sign of the cross, and very devoutly addressing his first words to God in prayer, he exchanged with his servants, in agreeable familiarity, some pleasant and happy remarks, so that his kindness and gentleness would encourage even the least of them to joke and enjoy themselves with him, / p. 237 however humble they might be. They all enjoyed these comments and exchanges. When he had been combed, dressed, and outfitted according to the demands of the day's program, his chaplain, a distinguished person and honorable priest, brought him his breviary and helped him to say his hours, according to the canonical day of the calendar. Around eight o'clock he would go to mass, which was celebrated each day with glorious, melodious, solemn singing. In the retirement of his oratory low masses were sung for him. In winter, especially, he often occupied himself by having read to him fine stories from the Holy Scriptures, or the Deeds of the Romans, or Wise Sayings of the Philosophers and such matters until the hour of supper, where he took his place rather early for a light meal. After this, he spent a short period in recreation with his barons and knights before retiring to rest. And thus in continual good order, this wise and well-bread king followed the course of his life. 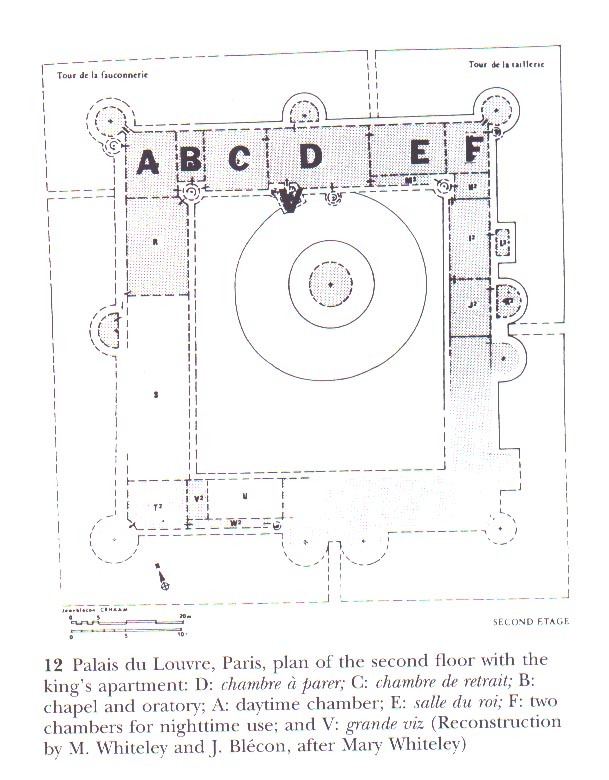 Plan of the Second Floor of the Louvre: Lodgings of the King: A: chambre; B: chapel and oratory; C: chambre de retrait; D: chambre à parer; E: salle; F: two chambres for night time use. V: grande vis (staircase leading to the chambre à parer);Lodgings of the Dauphin: H: chapel; I: chambre à parer; J: chambre; K: petite chambre; L: petite chambre. 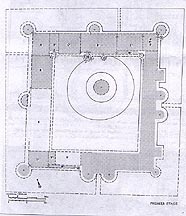 R: grande chambre du Louvre; S: grande salle (Great Hall) (extends from the ground floor into the second floor); U: Great Chapel (extends from the ground floor).